Home Costs > How Much Does it Cost to Replace an Electrical Panel? How Much Does it Cost to Replace an Electrical Panel? A circuit breaker’s function, as you may know, is to protect an electrical circuit from damage which is caused by an overload or short circuit. Circuit breakers can save your electrical devices and can even help prevent a fire caused by an electrical overload. Circuit breakers, without any professional installation, can be purchased for $50 to $125, depending on where you live, the hardware needed, the replacement size, amp size, number of circuits, how they can access the work and other factors; however, if you needed an electrician to install the breaker, this would be about $200 per, depending on the electrician you choose and your geographical location. To replace an entire breaker, plan on budgeting $1,500 to more than $3,500, especially if you live in a higher cost neighborhood. The more breakers you have done at once, the less you will pay per breaker. For example, ElectricianFAQ.com lists their charges on their website. If you were to replace a standard 15 to 60 amp circuit breaker, then you will pay $175 to replace the 1st breaker, followed by $75 to $125 for each additional breaker. If you had to replace a standard AFCI 15 to 25 amp circuit breaker, then the costs would be $250 for the first breaker and an additional $150 for each breaker after. According to this eichlernetwork.com article, the $1,700 estimate given by a reader was on the lower end and the electrician stated you should be prepared to spend $2,500 to $3,000 or more, depending on the complexity of the job. Inspectapedia.com says the costs can be in the $1,200 to $4,000 to replace the entire panel, but typical 100-amp panes should be in the $1,200 to $2,100 range, depending on where you live. Searching around the Internet, we were able to find quite a few quotes from people on what they paid for circuit breaker work. The quotes we found are listed in the table below, along with their geographical location. Dallas, TX $3,500 to bring 240 amp breaker up to code. As with any professional service, a larger metropolitan area will always be more than a rural cow town. Most municipalities will require permits and these fees will be incorporated into the quote or paid separately by the homeowner. Some older electrical panels may be straightforward, while others may need more demolition than the average job, followed by cosmetic repairs after the job has been performed. Alongside the labor involved, the condition needs to be looked at as well. For example, if the wire insulation were damaged or in poor shape, then the electrician will want to replace it to prevent it from overheating or worsening in the future. By code, some wiring such as knob and tube wiring may need to be replaced, or at a minimum, it may need to be modified depending on where you live. 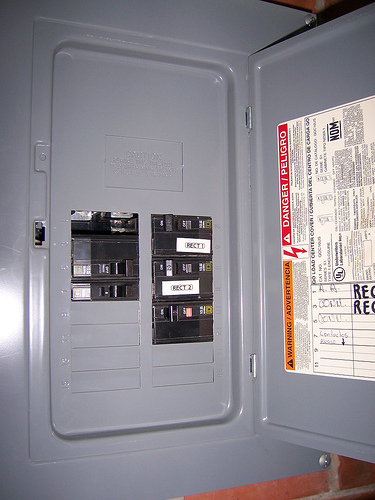 If the existing panel makes it hard to connect the existing wires to the breaker, then a larger box will be required. Electrical panels will control the electricity flow inside a home and can be 100, 150, 200 or 400 amps. In older homes, the capacity, while rare, may be lower, but as of today, the minimum required is 100 amps. The most common found in older homes is 150 amps, but newer homes are being built with 400 amp boxes, which is achieved by using two 200-amp panels and a 400-amp meter. Older and obsolete circuit breakers, according to our quotes, can cost about 20 to 40 percent more. The same can be said about breakers located in awkward locations which make it hard for an electrician to access, especially if they had to run new wires or even tear down a wall. While it may be tempting to do it on your own, it’s highly advisable you avoid doing so as you’re dealing with electrical wiring and even the local planning department. To avoid having multiple electricians come out, charge a minimum service fee and offer you a quote, consider getting multiple quotes via the Internet and/or phone for free at HomeAdvisor.com. When hiring a professional electrician, check for references, review complaints online and make sure they are licensed. If one breaker goes out, there’s a good chance others will follow since they are aging at the same rate. If you can afford, it’s best to replace the entire breaker to avoid costly electrician visits in the future. Remember: Even if the electrician visits and does no work, then they will charge you a service fee.